If you haven't already hit this part of your health and fitness journey, we all eventually get to a point where the scale just doesn't go down the way we would like for it to. I had struggled for a couple months and then Michael revamped my meal plan completely and last week I lost 7.2 pounds. This week I continued on the same path and only lost .4, so not quite a half a pound. As I mentioned to Michael, I was hoping for more, but won't get upset because the important thing is the scale still went down. And because I'm such an analytical minded person, that this really did help me put it into perspective. 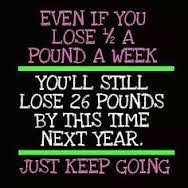 Even losing an average of 1/2 pound a week, that's still 26 pounds in a year, and that's still amazing! I'm moving forward with the same revamped meal plan, and see what happens this week. I've got a lot going on in my personal and work life, and the important thing is I continue to keep things balanced and not let stress from one part of my life carry over to another part of my life. If I stay focused, positive, and determined I'll meet all my goals, and I can also still say I've lost 138 pounds! If you're struggling, whatever you do, don't give up! Reach out to those who are always supporting and encouraging you, and it might take time, but just keep moving forward and things will fall into place!